The CHATILLON® CMA Series digital scale is a precision weighing solution for high capacity weighting. The CMA Series is ideal for warehouse applications. The CMA Series is available in six capacities from 1320 lbs to 22,000 lbs (600 to 10,000 kg). All CMA Series have a measurement accuracy of better than 0.2% full scale. The scale features an easy-to-read, LED display that indicates measured values in either pounds (lbs) or kilograms (kg). A cast aluminum housing makes the CMA ideal for harsh environments. The CMA Series is poweredusing rechargeable battery pack. The scale can display the peak weight. 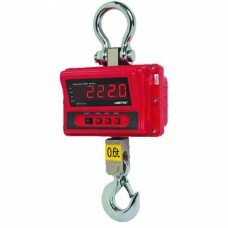 You may add accessories and tare out their weight up to 100% of the scale's rated capacity. Operation is simple using the integral push-button style keys or using the optional wireless remote controller. The remote controller lets you change units, clearmeasurements, zero and tare out weight at a distance of up to 100 feet (30 m). 1 yr warranty. 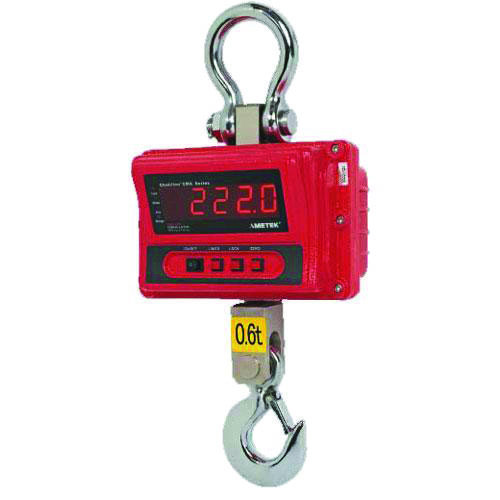 The CMA Series scale is supplied with hanging loop, S-hook, charger/adapter with US, EU and UK plug adapter. The CMA Series is supplied with a Certificate of Conformance. An optionally available Certificate of Calibration with NIST is vailable.